Recently I was contacted by someone who was concerned about the beings that he was channeling. They claimed to be archangels, and yet these beings were untruthful, manipulative and occasionally even malicious. They even gave him unwanted ‘attunements’. This is not the first time I have encountered false angels. Several years I had my own experience with them. I was meditating with a group of lightworkers when two false angels appeared on the astral plane. They grabbed hold of my hand and pulled me through a wormhole. It happened so quickly I was disoriented, and yet I sensed we were moving interdimensionally. Then I came to my senses, and yelled, “Stop!” Everything froze, and we were suspended in a cloudy white space. I took a closer look at the male and female ‘angels’ and saw that their features were much sharper and pointier than the angels I knew and loved. Their strange appearance, coupled with their bizarre behaviour, told me all I needed to know. They tugged at my hand and tried to get me to move, but I dug in my heels and shouted, “No!” They backed off, looking surprised. I then called for Archangel Michael to come to my aid. A being similar to Michael appeared. He had the right colours in his aura (royal blue and purple), but his features were sharply angular, just like the other two. I backed away from him, and called for the real Archangel Michael. Within two seconds, the angel I know and love appeared. As soon as the real Michael materialized, the three false angels looked startled and then quickly scattered. Archangel Michael gently escorted me back home. Aside from these two experiences, I have fielded many questions over the years concerning false light beings. It would seem that many service-to-self spirits love to impersonate angels. That’s one of the reasons that the topic of angels elicits mixed reviews. Over the course of human history, we have been visited, and interfered with, by many off-worlders (both corporeal and non) claiming to be gods and angels. 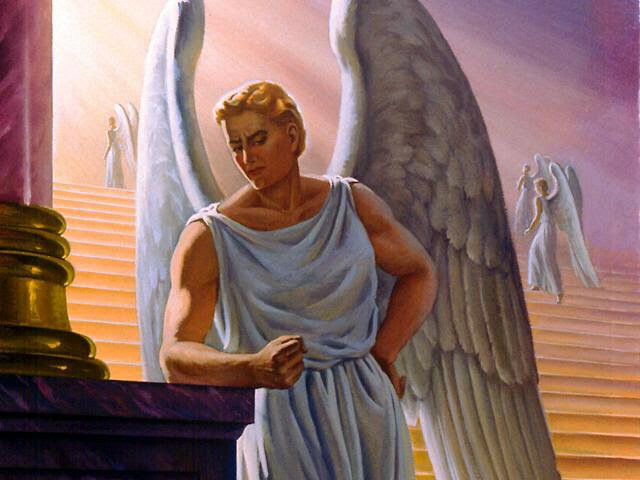 These negative interactions with false angels have left us with an uneasy feeling about the angelics. Despite the spate of impersonators, human consciousness is awakening, and with that expanded awareness comes the ability to discern light from dark entities. There is no reason to shut yourself off from the angels providing you learn to discern the difference between the false and real angels. Positive: They always leave you feeling uplifted, happy and relaxed. Every interaction is a positive one, without exception. Loving: Angels absolutely adore us! They are nurturing, caring, kind and compassionate, and completely devoid of ego. Giving: Each of us have guardian angels who protect, love, heal, nurture and guide us. The archangels assist the guardian angels. They work tirelessly on our behalf and ask for nothing in return. This is how angels serve the greater good. Beautiful: Whether you can see them with your physical eyes or your third eye, they are always beautiful. They shimmer and glow, radiating pure light. They are never dark or frightening in appearance. They even smell good. Empowering: They encourage and help you to own your power. Angels will gladly teach you to use your spiritual gifts and powers of discernment, if you ask. They never give or take anything from you that would lessen your personal power. Spiritual: Angels are connected to Source/Divine Light. They are not affiliated with man-made organizations or religions. * One exception to the Law of Free Will: Angels can save your life if it is not your time to go Home. But even that is ultimately determined by you, based on the life chart you wrote before incarnating here. Your guardian angels know what is in your life chart, and they watch over you to ensure that you have the experience here that your soul desires. Negative/Frightening: These beings leave you feeling angry, anxious, frightened, depressed, sad, and/or ill. You may also feel cold when they are near. Lower Perspective: If these false light beings give you information through channeling or readings, it may turn out to be correct, but it will not produce the most positive results. They may in fact give you more information than is in your highest good, or tell you things that scare you (i.e. predicting a death). Selfish: False light beings always have an ulterior motive. On the less malevolent side, you have earthbound spirits who may be lost, frightened, lonely or bored. They might be playing with you, or want attention. The more malicious ones are trying to control you, and feed off your energy, through fear. Manipulative: Fake angels do not respect you or your free will. If they have an agenda, they will push it onto you, trying to get you to do something for them. Dark: Their looks are often unpleasant or even scary. Maybe their features are sharp, or they could be wearing hoods. They appear as dark orbs instead of light, and some have a strongly unpleasant odor. Honour your feelings: If the interaction doesn’t feel good, trust your instincts. Stay calm: Don’t get upset, frightened or angry. Stay as grounded as possible. Ask them to leave: Tell the being that you do not wish to talk/deal with them anymore, and respectfully ask them to leave. If you feel it appropriate, you can also tell them to go to the Light or to go Home. Envision them leaving: See them leaving your home and you then closing and locking the door behind them. That door is your protection. Don’t open that door and invite someone in unless you know who they are. Cleanse your home: To release the negativity, you can smudge with sage or call in the white light. Also cleanse your energy field. Tell/order them to leave: Be firm and tell them it’s time to go. Think of them as an unruly house guest. How would you handle a person who didn’t want to leave? Stand in your power. Call on the archangels: If you feel comfortable working with real angels, then call on Archangels Michael and Raphael. They are experts at spirit releasement. Not only will they remove the unwanted entity but they will also take him back home for healing. Get a home healing: Ask a trusted healer to cleanse the energy of your home, and to check your energy field too to ensure that you are free and clear of that unwanted entity.